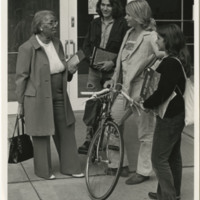 Septima P. Clark, 1973, Septima P. Clark Papers, courtesy of the Avery Research Center. 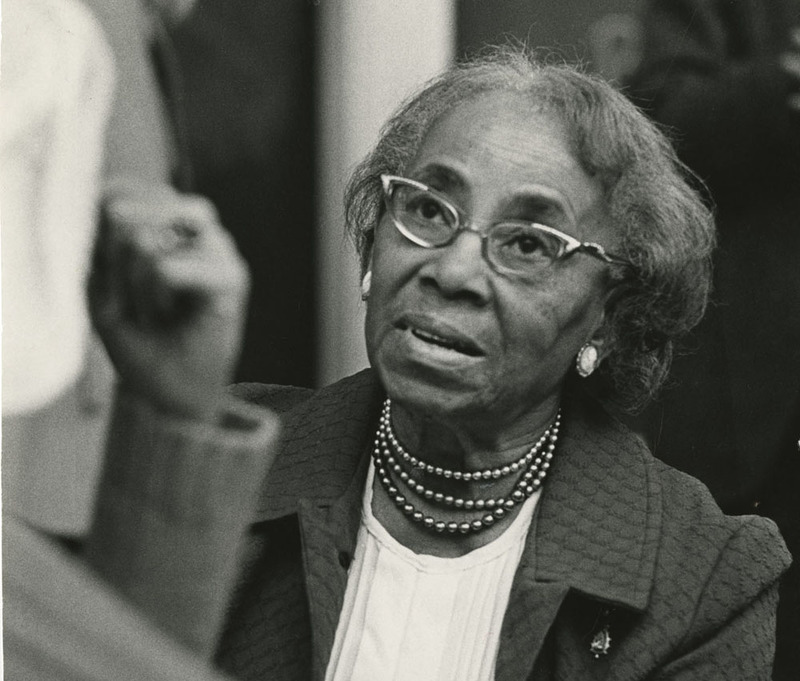 Septima Poinsette Clark (1898-1987) holds an important place in the history of the South Carolina Lowcountry and the United States as an influential African American educator and civil rights activist. She is best known for working with local and national leaders in civil rights organizations to establish Citizenship Schools—first on Johns Island, South Carolina in 1957, and eventually throughout the U.S. South. This groundbreaking adult literacy program was first sponsored by the Highlander Folk School and later the Southern Christian Leadership Conference (SCLC). Citizenship Schools focused on helping African Americans acquire practical literacy, as well as political and economic literacy, so that they could register to vote and access legal rights and resources to improve their communities. Between 1957 and 1970, more than 28,000 southern African Americans passed through these schools. 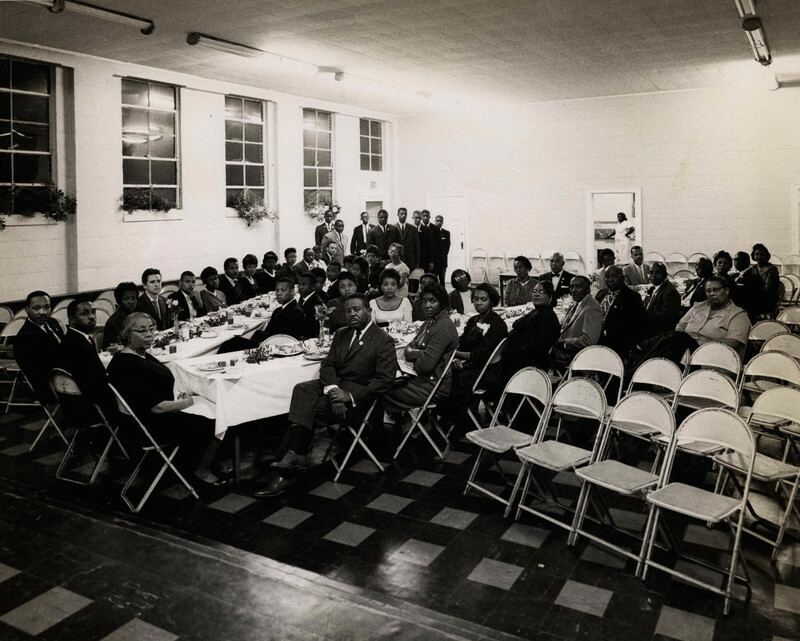 Connecting grassroots education to grassroots activism, the program played a crucial role in galvanizing people to participate in the civil rights movement. Equally significant, women predominated as teachers and students in the Citizenship Schools. Thus, these classrooms also functioned as powerful spaces for local African American women to hone leadership skills, which they then applied in communities across the South during the 1960s and beyond. 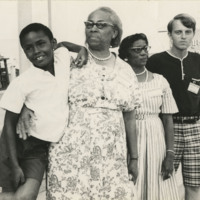 The Citizenship Education Training Center, Liberty County, Georgia, Septima P. Clark Papers, courtesy of the Avery Research Center. 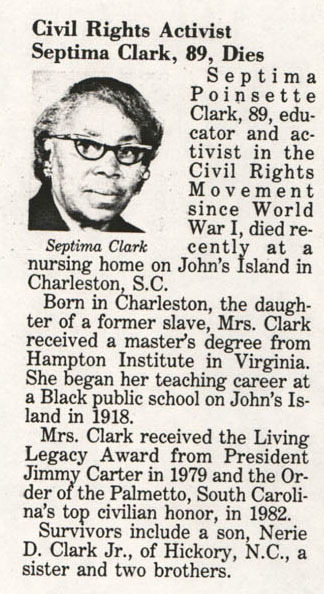 Septima P. Clark worked with local and national leaders in civil rights organizations to establish Citizenship Schools—first on Johns Island, South Carolina in 1957, and eventually throughout the U.S. South. 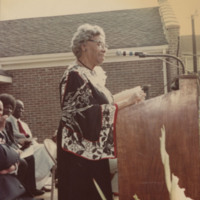 In the age of Jim Crow, Clark’s personal background in Charleston and teaching experiences in South Carolina enabled her to work within and across diverse communities to generate support for black education and social justice activism. A native Charlestonian, Clark’s family ties bridged intra-racial divisions between descendants of free people of color and enslaved African Americans in the city’s black communities at the turn of the century. Her father, Peter Porcher Poinsette, was born a slave, while her mother, Victoria Warren Anderson, came from a black family that was free before the Civil War. Both parents strongly supported Clark’s education. She graduated from Charleston’s prestigious Avery Normal Institute in the spring of 1916 and began her teaching career on nearby Johns Island that fall. Clark taught in both rural and urban public schools in South Carolina for the next forty years. Generating support for resource-starved segregated black schools provided her with valuable experience in community organizing. 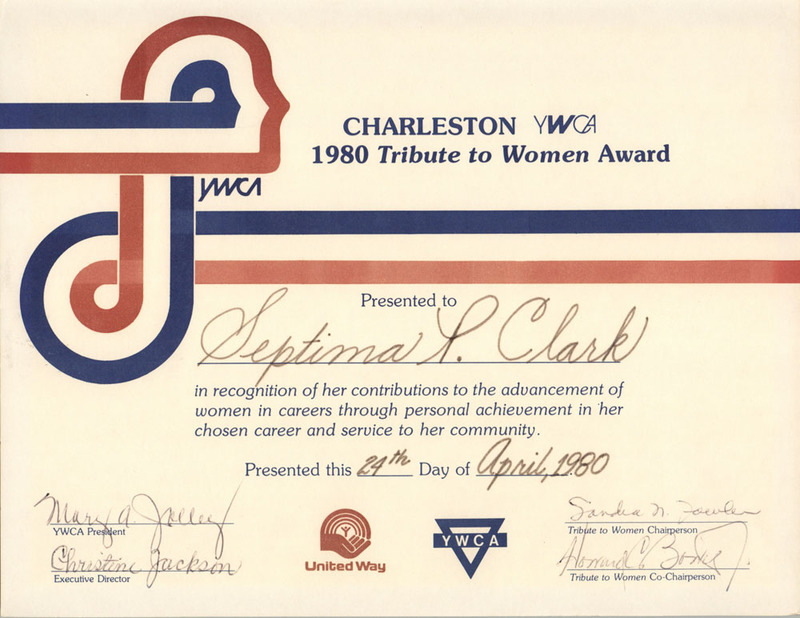 Moreover, Clark spent decades working in black women’s organizations, such as the YWCA, to mentor black girls and improve the quality of life for black South Carolinians. "Good-bye to Jim Crow? 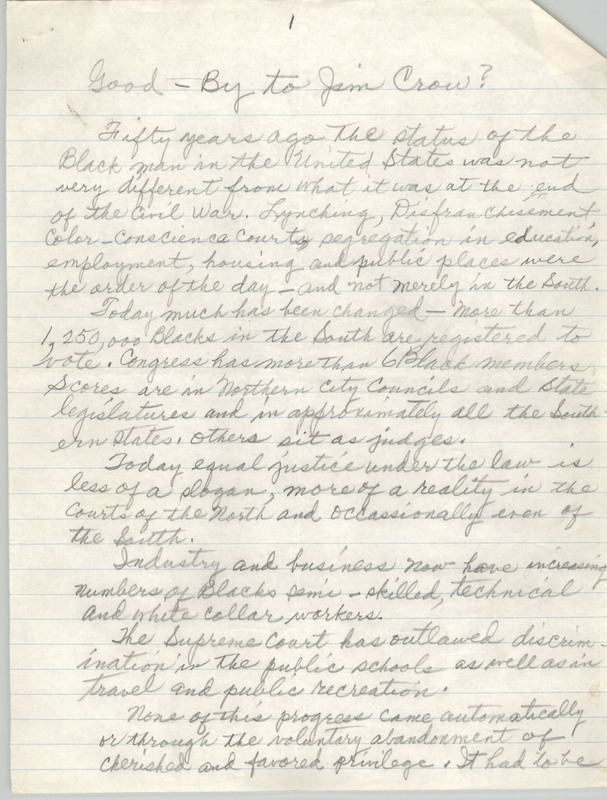 ", handwritten essay by Septima P. Clark "regarding the basic historic differences between black and white America," n.d., Septima P. Clark Papers, courtesy of the Avery Research Center. CLICK HERE to view larger image and full essay. 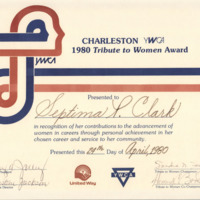 Clark’s more formal political activism began in the World War I era, when she joined the Charleston branch of the National Association for the Advancement of Colored People’s (NAACP) successful campaign to force the city to hire African American teachers and principals in its black public schools. Later, while living in Columbia, South Carolina during World War II, she also participated in the state NAACP’s lawsuits to secure equal pay for black teachers. 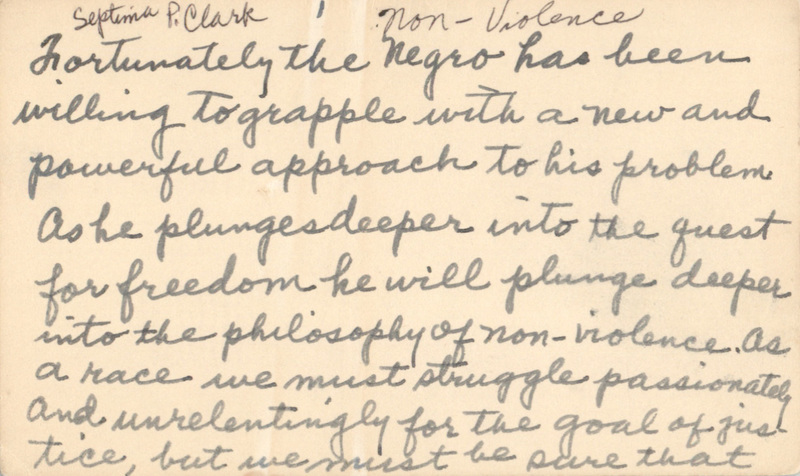 Clark later described this as her first “radical” act, because it meant filing suit against the white officials who employed African American teachers and controlled the school district. Notably, during the interwar years, Clark also taught adult literacy classes with Wil Lou Gray’s Opportunity Schools. 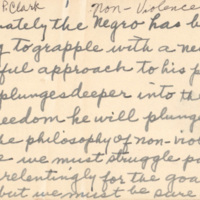 Collectively, these experiences prepared Clark to make her most significant contribution to the black freedom struggle during the civil rights movement of the 1950s and 1960s. 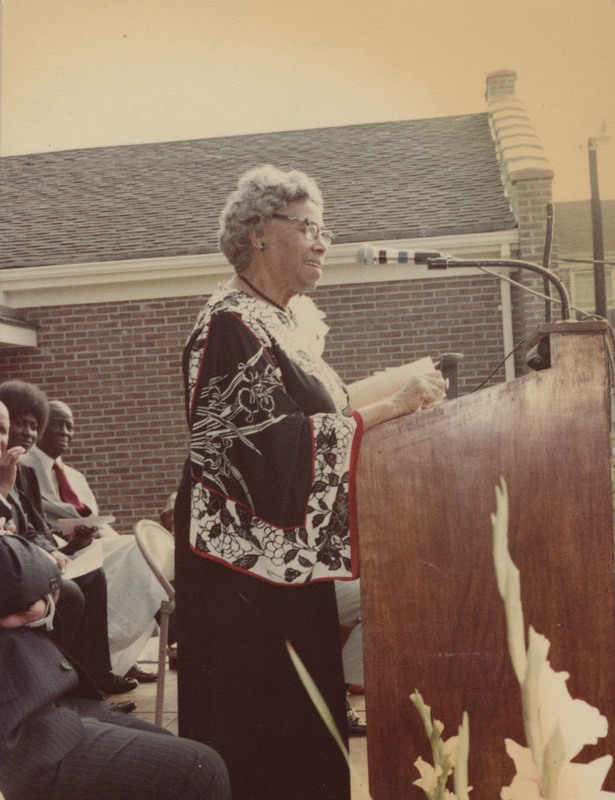 Clark retired from the SCLC in 1970 and returned to Charleston, where she continued her lifelong activist efforts with an emphasis on politics, women’s issues, African American children's needs, and care for the elderly. 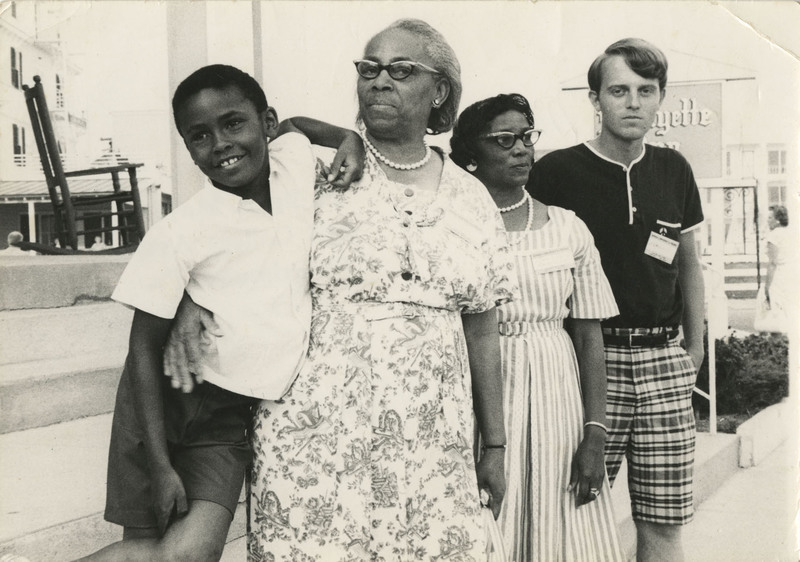 In 1972, she won election to the Charleston County School Board, becoming both its first female and first African American member. She also served on the local Advisory Council on Aging and worked with city clubwomen to establish a day care center. 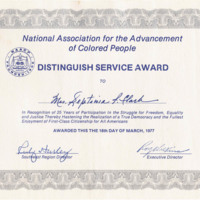 In 1976, she received a Race Relations Award from the National Education Association. Two years later, the College of Charleston awarded her an honorary doctorate of humane letters. 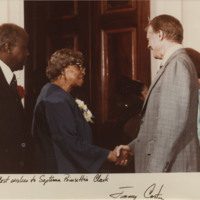 In 1979, President Jimmy Carter presented Clark with a Living Legacy Award. Finally, in 1982, the state of South Carolina awarded Clark the Order of the Palmetto, its highest honor for civilians. 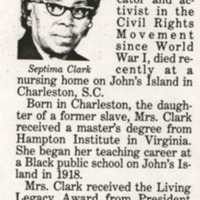 Clark passed away in 1987 at the Sea Island Health Center, which had been established by alumni of the Johns Island Citizenship School. 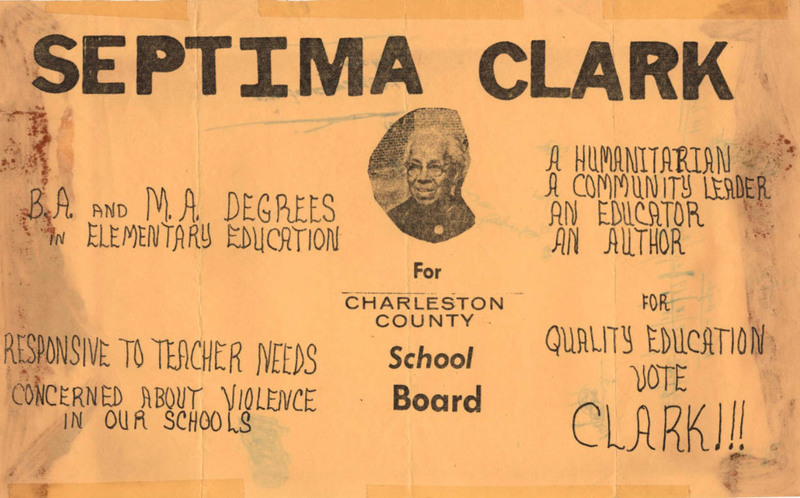 Flier for Septima P. Clark’s campaign for the Charleston County School Board, Charleston, South Carolina, ca. 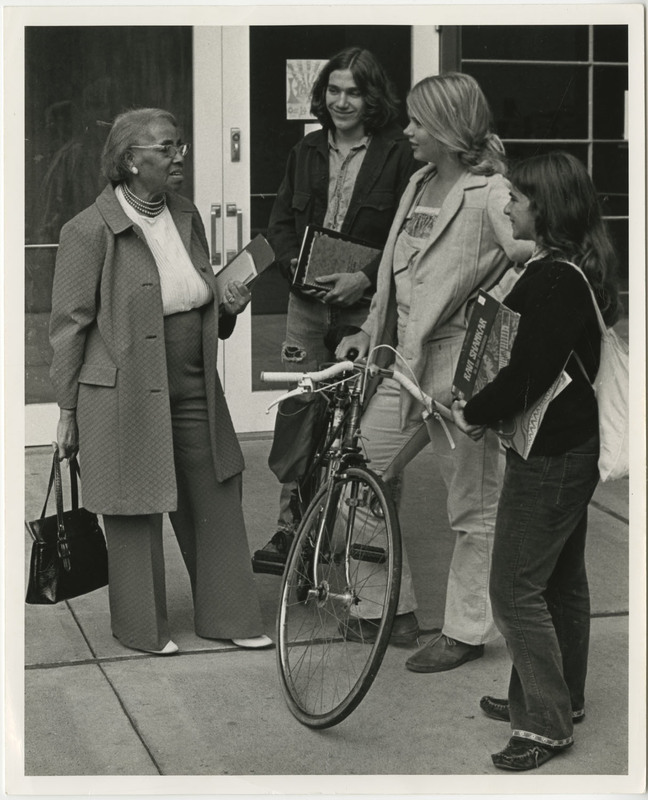 1970s, Septima P. Clark Papers, courtesy of the Avery Research Center. 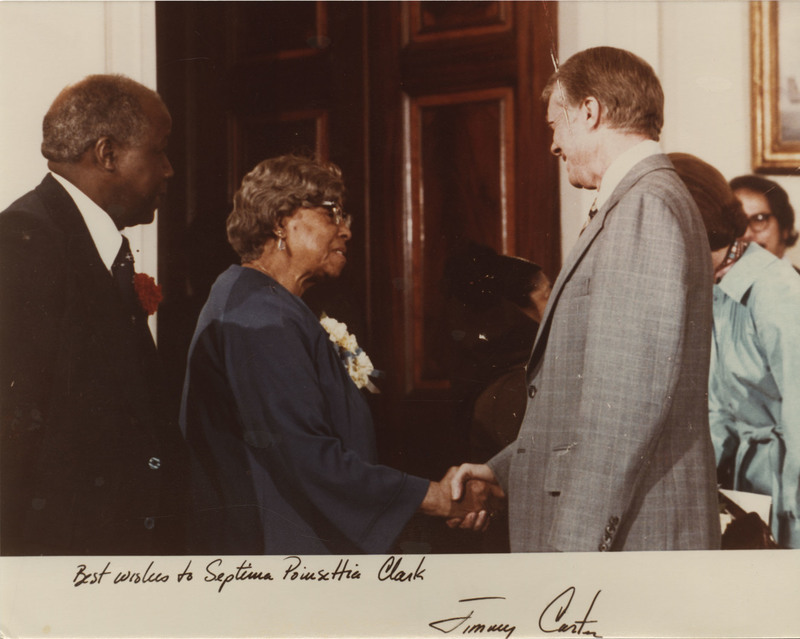 In 1972, Septima Clark was elected to the Charleston County School Board. She became the first woman to serve on the board and the only African American at the time. 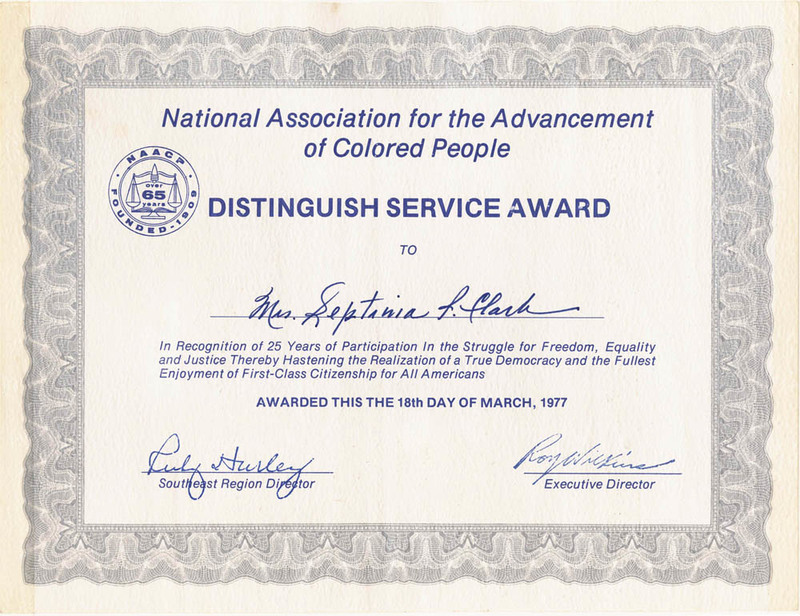 Sixteen years earlier, in 1956, members of the same board had dismissed Clark from a teaching position because of her affiliation with the NAACP.